Today’s episode is a MUST LISTEN for every woman. I’ve never been more passionate about spreading a message on The Lively Show. Regardless of whether you act on this information right away (or ever), I believe the information shared in this episode can truly be life and paradigm-changing for all women. We have a right to know this powerful information exists so that we can make informed decisions that affect every aspect of our lives. Please listen + share this episode with every woman you believe may benefit from hearing it. Did you know that today’s traditional nutrition, work schedule, and exercise recommendations are all centered around male hormone patterns? Did you know things like PMS, cramps, unexplained infertility, low libido, PCOS, endometriosis, fibroids, and eczema are improved or even fixable by optimizing our hormones? Today’s Lively Show features Alisa Vitti, an integrated nutritionist and hormone specialist. 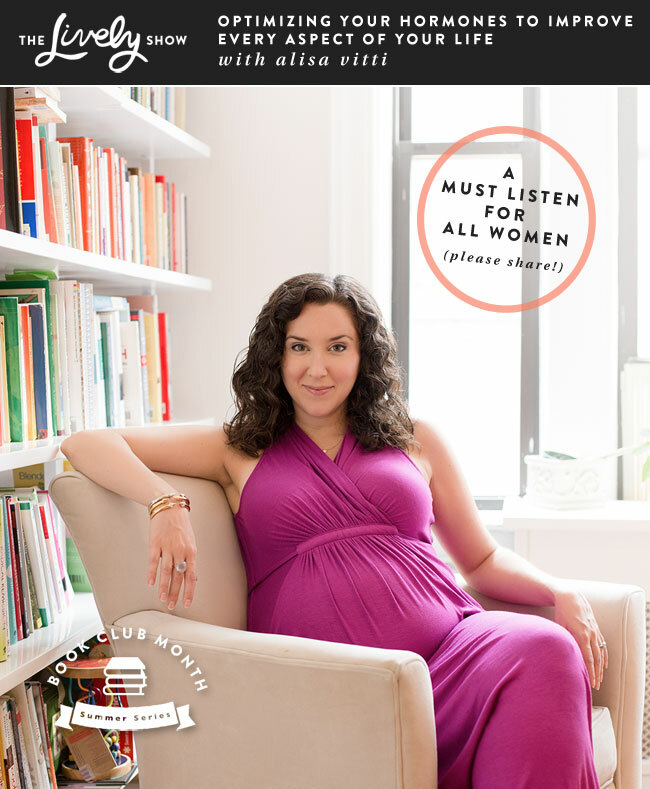 She’s also the founder of the online women’s health center, Flo Living, and author of the book, WomanCode. Alisa is sharing her personal journey with hormone imbalance, as well as how she’s reversed her medical diagnosis through working with her endocrine (hormone) system. She’s also explaining how we can optimize our lives in a female hormone-centric way, to improve our health, vitality, personal power, work, libido, fertility, and more. This episode is perfect for women looking to understand how we can optimize our hormones to improve every aspect of our lives. What inspired Alisa to start a period club in the 6th grade with her friends. The intuitive feeling she had as a young woman that something wasn’t right in her body. The severe health issues Alisa experienced in her 20’s and how she finally discovered what was the cause of her problems. Why Alisa decided to find an alternative to her doctor’s recommendations for how to treat her Polycystic Ovarian Syndrome (PCOS). Alisa explains what hormones and the endocrine system are, why they are important and why now is an especially important time for women to examine their hormonal health. Why Alisa’s protocol is helpful for any woman, not only women with serious issues like PCOS, fibroids and endometriosis. Why I initially experienced resistance to learning about Alisa’s protocol. Why she believes in eating, exercising and working differently throughout the month based on where you are in your cycle. Alisa’s advice to someone who is currently on the pill who would like to get healthy using the FLO protocol. Alisa’s advice to someone who might get criticized by friends and family about the new changes they are making. 3 baby steps you can take right now to get your health and hormones in balance. How having balanced hormones has given Alisa energy, focus and power both during and after her recent pregnancy. What Alisa would tell someone just starting out on this journey.